I went to Wind River last week, to the old Forest Service ranger training center. This wonderful old building was built in the 1930s by the Civilian Conservation Corps and put into use for the training of district rangers. Inside the meticulously maintained building is a large portrait of Gifford Pinchot (the first chief of the Forest Service) over a stone fireplace. He silently presided over our meeting as we discussed both gasoline and human powered saws. After the meetings I walked out through the old ranger station and experimental forest, mere ghosts of their former selves. The second-growth Douglas-firs reminded me of my coastal childhood in southwest Washington. The limbs were far over my head, making the woods seem like a room with a dense dark ceiling. Pale trunks of red alders lifted branches to the sky, still bare of leaves. Springy moss gave under my feet, and sword ferns fountained out of the ground. Looking down as I so often do, I spotted the tiny blue bells of grouseflower. And thought of my gramma. I was a grown woman when we walked together at her cousin Alice’s place along the south fork of the Chehalis River. Alice was a forest steward, leaving parts of her land undisturbed so that the native plants and animals flourished. It must have been an early spring day because Gramma pointed out a tiny flower that I couldn’t recall seeing before. That was a surprise–she was the first person to instruct me in the names of plants since I was big enough to reach up for her hand and walk with her. I thought I knew them all, but the grouseflower was a rarity. 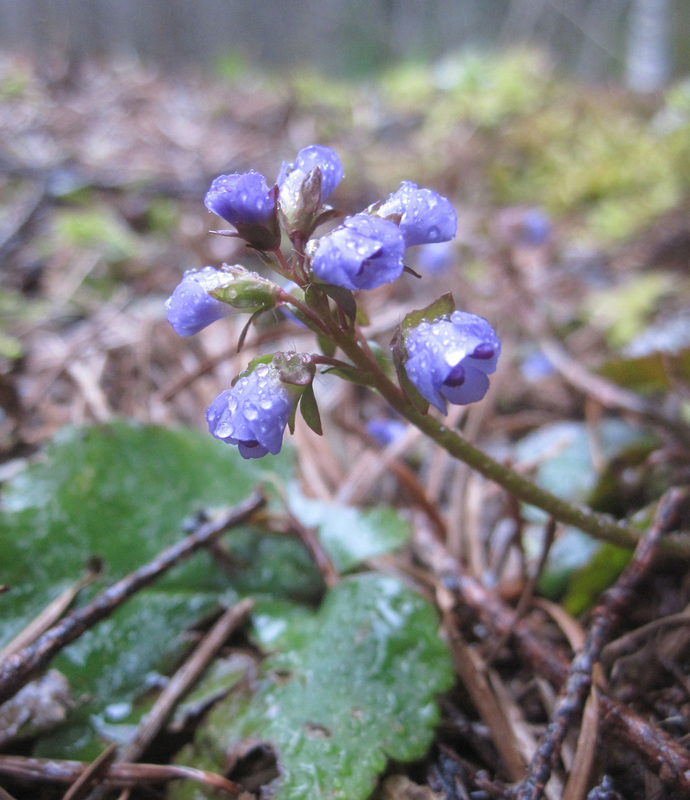 This one is Synthyris reniformis, Round-leaved synthyris, the smallest of four synthyrises found in the Pacific Northwest. “Western Washington and the Columbia Gorge; coniferous woods in the lowlands. Spring.” So says the venerable Washington Wildflowers published by the Seattle Audubon Society in 1974. Paused there in the woods, I was powerfully reminded of Gramma. One of the most important people in my life–I knew her for 52 years. She died two years ago. Why don’t I miss her more? I can still be bowled over by grief for other loved ones lost long ago. Some small event triggers a longing for their presence and for a moment the loss cuts as sharp as a newly-filed saw tooth. Gramma and I were kindred spirits who understood each other from the beginning. It was hard to watch her grow old and suffer, hard when she finally released her grip on life. But it was her time to go. Why don’t I miss her more? In the hush of the trees and dampness of the spring woods the answer came: because I am her. An extension of her, a continuation of her way of living. She gave me awareness of growing things–flowers and birds and frogs. She taught my hands and eyes, guided me in the ways of needle and thread, yarn, ax and shovel, butter churn and bread bowl. She carried matches and a pocket knife and it seemed there was nothing she couldn’t do: feed a haying crew, tend a calf, back up the dump truck, change a diaper, play the piano. Her brown eyes sparkled and she laughed often. She was fierce and kind and devoted. How can you miss what isn’t gone? When the grouseflower and I happen to be in the same place at the same time, I hold still and remember. And I notice that nothing is missing.